Group introduction: "Translational Research: from Basic Insight to Clinical Application"
The Biomedical MR research group is one of the three main research groups at the department of Radiology of the Radboud University (RU). The aim of this group is to exploit the exquisite capabilities of MR in “molecular” and “biological” imaging to address biomedical questions and problems. The unique properties of MR are used at the fundamental and applied level for a better understanding of disease processes and for the improvement of diagnostics and treatment evaluation in clinical examinations. The translational aspect in our scientific research is important involving complementary animal and human studies. To bring the (pre-)clinical applications at a high level we invest in the development and implementation of MR methods on a variety of advanced MR systems (see below). Main biomedical topics of our MR research: oncology and diseases caused by defective energy metabolism. The focus in human oncology is on prostate and brain cancer, but attention is also given to cancer in the breast and liver and Lymphoma's. We have participated in the first human cell tracking studies using iron particles as contrast. Pathologies with energy metabolism related problems that we focus on include diabetes and metabolic disease (skeletal muscle, brain). Animal studies in oncology concern representative cancer models of human conditions. E.g. tumours with different levels of vascularization and hypoxia. Studies on energy regulation are focused on skeletal muscle and brain mostly with transgenic mice. We have 15 year experience in MR of transgenic mice. In this research the multi-modality possibilities of MR are exploited: e.g. 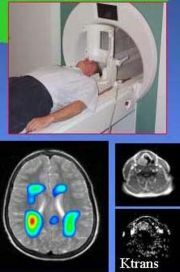 MR relaxometry (T1, T2, T2*), MR spectroscopy, MR diffusion, MR perfusion (dynamic contrast enhanced MRI), BOLD, etc. We use bio-organic molecules labeled with various MR contrast agents (Gd, Fe) to obtain specific contrast for tissues and cells, metabolism, blood flow and vessel volume and permeability. Technical specialities include: multi-nuclei MR using 31P, 13C or 19F as natural spin labels in endogenous and exogenous molecules and advanced MRS acquisition methods. 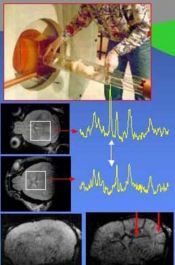 We are also involved in molecular imaging approaches, wherein MR is combined with nuclear and optical techniques. To make optimal use of the expertise and possibilities available at the RUN-MC, our department works together with the Nuclear Medicine and Radiotherapy departments in an animal imaging centre which is equipped with the best hardware for molecular imaging. This centre facilitates fast translation of experimental imaging methods to the clinical setting. Collaborations: Within the department we collaborate with the Clinical Research and CAD groups. Furthermore, we collaborate with a large number of preclinical and clinical groups and Insitutions at the University Hospital (NCLMS, Inst Neuroscience), and with other groups at the RU Nijmegen such as the FCDonders Institute for brain imaging, the science departments of Physical Chemistry, of Organic Chemistry and of Chemometrics. We also participate in a several national and international collaborations and projects (IFKB, VISTA, EU).